New & Used Cantilever Lumber Racking Systems For Lumber, Furniture, Pipe & Other Long Odd Shaped Products Or Material. Precision inventory control and product protection are two things that are vital to recession proofing any business involved in the distribution of lumber or the manufacture of wooden products like furniture. Cantilever lumber racks offer a very low-cost means to accomplishing both, and they can support up to several thousand pounds in weight. These systems are best custom built, because the capacity and size of a cantilever lumber rack will be determined by product length, type of lumber cut, and the total weight capacity supported by the arms. Precise calculations have to be made to ensure evenly distributed loading. Uneven loads will reduce the total capacity of the rack by 50%, so it is advisable to consult with a rack specialist who can assist in calculation such factors as arm capacities, column capacities, cantilever column load distribution, in proper ratios to the application and products at hand. Cantilever lumber racks are intended to organize and protect cuts of lumber by keeping them off the floor and providing an efficient method of categorizing various dimensions and types of wood. Cantilever lumber racks can be built with single or double-sided towers. If base assemblies are stackable, it allows towers to be joined together to create entire rows of storage. This is an extremely efficient method of space management in crowded warehouses. 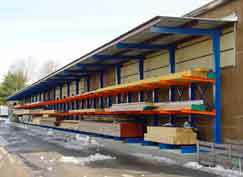 Cantilever lumber racks take up much less space than pallet racks, and so long as they are anchored properly to the concrete floor and built with appropriately proportioned columns, arms, and braces, they can be built very tall so as to minimize their consumption of horizontal floor space and make it easier for forklifts to access their contents. Cantilever racks are vital to the lumber industry. Almost all cuts of timber feature a variety of lengths, widths, and thicknesses. Organizing these cuts by sheer dimensions alone is difficult enough. When you consider the added difficulty in categorizing lumber by wood type, it quickly becomes evident how difficulty inventory control without a system of organization and a convenient method of retrieval. Wood is also very vulnerable to impact and moisture and requires some special storage considerations. Even indoors in very hot, humid climates, warehouses can be too humid for the long-term storage of lumber, and leaving boards, planks, and sheets on the floor invites damage, mold, and safety concerns. Cantilever lumber racks both elevate and separate lumber by size and type, placing it closer to fans or other forms of ventilation, or making it possible to cover the lumber with plastic or tarpaulins in order to prevent it from becoming damp. 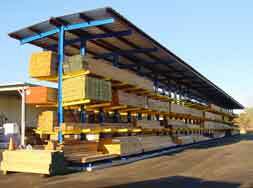 The most common type of cantilever rack that is used to store lumber is the structural rack. Structural cantilever racking is used for more heavy-duty applications such as lumber and pipe storage. Structural components generally include structural columns and bases, roll-formed arms, horizontal bracings, X-Bracings, and hardware used to mount the units. X-braces can be either 48” or 60” wide. Columns, as we have already mentioned, can be either single-sided or double sided. Many lumber yards prefer to use double-sided cantilever lumber racks because this allows them to create rows for forklifts to move through. It also makes better use of space to build this type of system if there is sufficient area in which to do so. Easy Rack carries a wide variety of commercial shelving, material handling equipment, used pallet racks, used pallet racking and modular prefab buildings installed nationwide. If you can not find what you are looking for call us toll free at 1-888-776-3720 and we will find it for you. Our home office is located in Houston, Texas with warehouses located throughout the United States that enable us to service all 50 states including Washington DC, Nashville-Davidson, Tennessee, Las Vegas, Nevada. Portland, Oregon, Oklahoma City, Oklahoma, Tucson, Arizona, Long Beach, California, Atlanta, Georgia, Fresno, California, Sacramento, CA, Corpus Christi, TX, Plano, Texas, Garland, TX, Laredo, Texas, Lubbock, TX, Jersey City, NJ Newark, New Jersey. We Represent The Folowing Manufacturers Of Cantilever Rack. Regional Cantiler Rack Distribution Centers.